Medium format equipment these days can produce 50 megapixel images. Most digital SLRs are between 24 and 36 megapixels now. Even point and shoot cameras can capture 18 megapixels or more. Even though I just said in the previous paragraph that resolution does equate to quality, it is important, because a higher resolution image allows more flexibility for cropping and manipulation. So if that art director doesn’t want all that foreground that you’ve included in the shot, they can simply crop the photo and not sacrifice too much resolution to get only what they need. A low resolution image can’t be cropped much without some pixelation occurring. For what I’m doing, 20 megapixels is the minimum. The 18-200mm f/3.5-5.6 lens will do a great job in adequate light, but what about getting that shot at night? The camera itself must perform well in low-light with ISO setting as high as 12,800, but a fast lens with f/2.8 or even f/1.8 helps capture images in that fading golden light near sunset. With a lightweight tripod, you’ll also be able to get the lights of the city, moonrise over a dune, or even the stars at night. The gear in my camera bag must be able to accommodate all the various lighting I’ll encounter, without the artificial look of flash. In the past, I brought an extra camera body just to be sure that in case of a failure, I still had a way to get the shot I wanted. These days, I can’t say that digital cameras have improved in durability, but I certainly have more options. I’ll bring my SLR and a couple of lenses, but I don’t need to go overboard with an additional body any more. I’ll often carry a small point and shoot camera that doubles as my underwater camera and my backup, and, I have my phone which has a camera built-in that can at least record the experience in an emergency. I probably can’t sell images from the P&S or my phone, but a lot depends on the clients needs. I could go full-frame but that would mean I would need to bring a large Nikon camera body or get a very expensive, but smaller, Sony full-frame camera. Getting a new Sony system and lenses isn’t in the budget, nor do I want the extra weight of a full frame Nikon, so I have to make compromises and stick with APS-C. Sure, I’ll be sacrificing better low-light performance, improved depth of field, especially with video, and more available wide angle lenses. However, the current batch of Nikon APS-C is greatly improved, and is incredibly small and lightweight, so I’m willing to make some concessions. When I carry around a bag full of equipment all day long, every ounce counts and I’m happy to find any way to trim the fat. My current system doesn’t do video and I don’t want rely on a separate camera to switch to video. It just never seems to be handy when the opportunity arises. Whatever I get needs to have 1080P video, external microphone connection, and no rolling shutter effect. All in the same camera I’m shooting at 24 megapixel. Why? Because video sells, or at least it gets everyone’s attention. It’s was really convenient to have GPS built into a camera. Having exact coordinates geotagged to a shot was a great way to find out more information about a location or be able to return at a later date. What isn’t convenient is an external GPS that can get damaged, gets lost, gets in the way, or doesn’t work reliably unless conditions are perfect. The places I’m traveling may not have reliable power available; some places may not even have power at all. The rechargeable battery must be able to last for at least 600 shots otherwise, I might miss an opportunity just because of low battery. My old D300 body has a grip with a battery tray that takes 8 AA batteries. A great idea, but also more weight. After quite a bit of research, I have shortlisted a few cameras, along with what I consider to be essentials for travel photography. These cameras fulfill most of the requirements, although I have yet to find one that satisfies them all. Weight w/lens 1030 g. 970 g. 813 g. 831 g.
With the Nikon cameras, I’m using the Nikon AF-S 18-300mm f/3.5-5.6G ED VR lens, which doesn’t have the wide-angle I’d like to have. I can take along my Nikon AF-S 12-24mm f/4G to give me a 35mm equivalent of 18-36mm wide-angle, but that lens is heavy and bulky. The Sony and Panasonic are bridge SLR cameras, meaning they look and function similar to an SLR, but the lenses don’t interchange. I like the 4K video on the Panasonic, but in reality, who has a 4K television or monitor, and would I want to use up 100Mbps on my memory cards? I’m leaning toward the Nikon D5500 even though it doesn’t have GPS. It uses Wifi to connect to my phone to get coordinates, so it may not be as important. It’s also using a slightly larger APS-C sensor versus the 1″ sensors in the Sony and Panasonic. Plus, it has the highest battery life, has an actual optical viewfinder, and still keeps weight under 1 kilo. I find that many photos cannot be created without the help of a steady tripod. Getting water that looks like silk, capturing the evening sky or city skyline, or creating 360° panoramics can only be done with a good tripod. My Gitzos have been workhorses for my commercial work, but I have yet to find a Gitzo with the features I’m looking for in a travel tripod at a reasonable price. 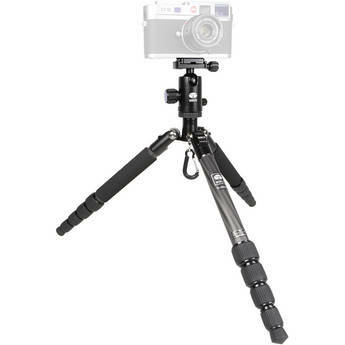 So, I started looking at the recent batch of Chinese made tripods and I’m seriously considering the Sirui – T-025X Carbon Fiber Tripod with C-10X Ball Head, because it has the features I need: supports up to 5 kilos, weights less than 1 kilo, collapses to under 1 foot yet expands to 4.5 feet, has an Arca-compatible ball head, and seems fairly solid and stable. There are few additional items my camera bag will need. Since I’ll be on the road for quite a while, often without Internet access, lots of memory cards will be essential. I plan on carrying at least a dozen 32Gb SD cards to give me close to 7000 images. I can’t count on my cloud storage to be easily accessible in some locations, so I’ll also carry a 1Tb backup drive for my laptop to store images as well. Of course, the cards will be in a sealed Pelican 0915 Memory Card Case. To get some of the water shots, I’m planning on bringing a 77mm variable ND filter along with a rectangular graduated ND filter to balance bright skies. The variable ND filter also doubles as a polarizer. To achieve some great depth of field and for nighttime shots, I plan to bring a 35mm f/1.8 lens. I want to bring my panoramic rig, but haven’t yet decided if it’s worth it to not have to manually stitch images. With my old D300 and L-bracket, I could get away with using just the bottom part of the pano rig. But with a smaller body camera, the lens might rub against the bottom, so I’ll need to use both parts of it. Again, heavy and bulky. The alternative would be to use the built-in panoramic mode on my phone, but that won’t do an entire 360° pano unless I stitch together 3 such images. Finally, I need spare batteries, shutter release cables, chargers, and various plug adapters for the different countries. I’d like to be able to get all this into my Think Tank Photo Change-up bag, however, to be more discreet about the gear I’m carrying, I may just get a neoprene case and throw it all into my daypack. I’ll be making a decision soon on a camera. I’m fairly certain on my choice of tripod and I still need to decide exactly in what bag I’m going to carry all of this. So an update is coming, and maybe, before I actually have to buy this stuff, there will be new cameras to meet all my needs. Well, at least I can dream.